9 Great Tips for Adapting Materials You Already Own! Therapy doesn’t always have to be expensive, if you use materials you already have around the house creatively! It also helps if you have garage sales in your neighborhood or if you know people that have kids. Don’t be afraid to ask them to let you go through their kids’ toys and books before they get rid of them! Adapting items you have takes a little time, but building up a supply of activities around a theme makes working with mixed level groups much easier! Being able to mix and match the materials for different groups’ needs also keeps you from having to do the exact same activity all day long. 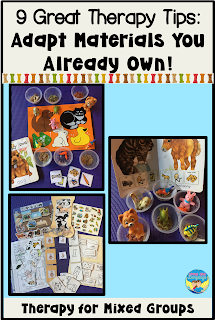 These examples have a pet theme; so fun to do in the spring. 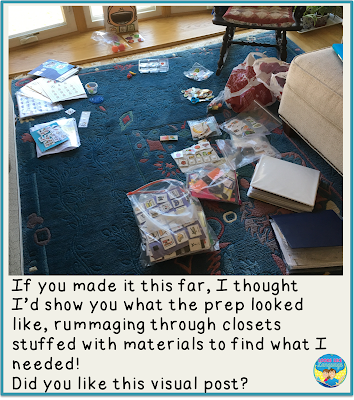 Tip 1: ORGANIZE AND KEEP COLLECTING! 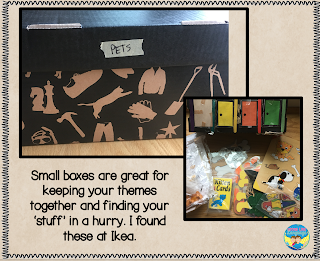 Buy some inexpensive boxes to keep the toys and books you’ve found for each theme all in one place. Add to the theme as you find inexpensive items. Tip 2: GET SOME PUZZLES! 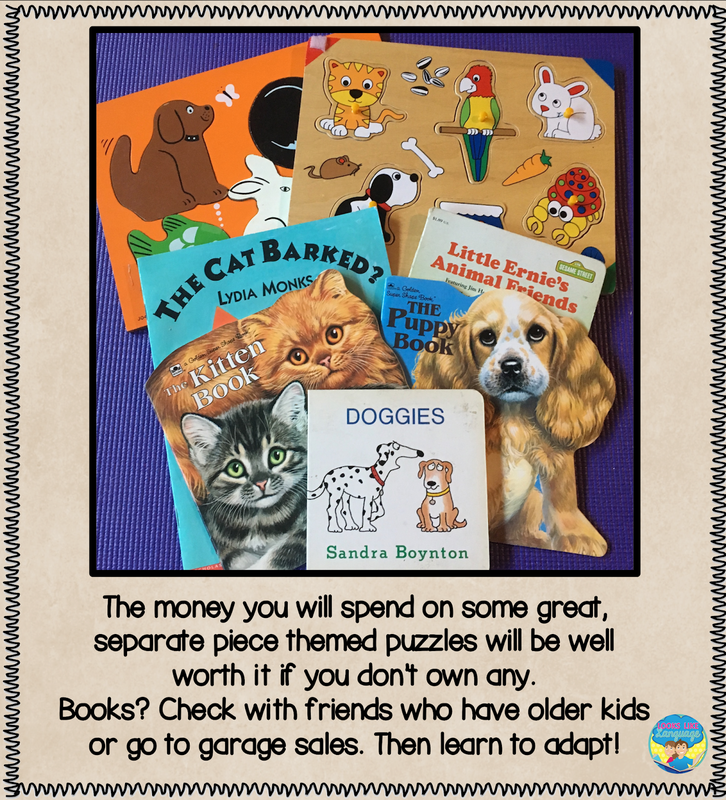 If you have students with low level skills or minimal language, puzzles that have separate pieces of whole items are worth spending some money for. Tip 3: BOOKS! MUST HAVE BOOKS! Find varied books on that theme with different levels and great pictures. This will let you build literacy skills while choosing the book that is easiest to elicit the specific language each groups is working on. Taping symbols over the book text to adapt it to be a simple repetitive book is simple to do. Just adapt the size of the symbols so that the original text is covered and use a wide roll of clear tape that extends past the paper to hold it firmly in place. The book in the photo is still in good shape after 20 years. Don’t use school tape, though, as it will yellow and peel. 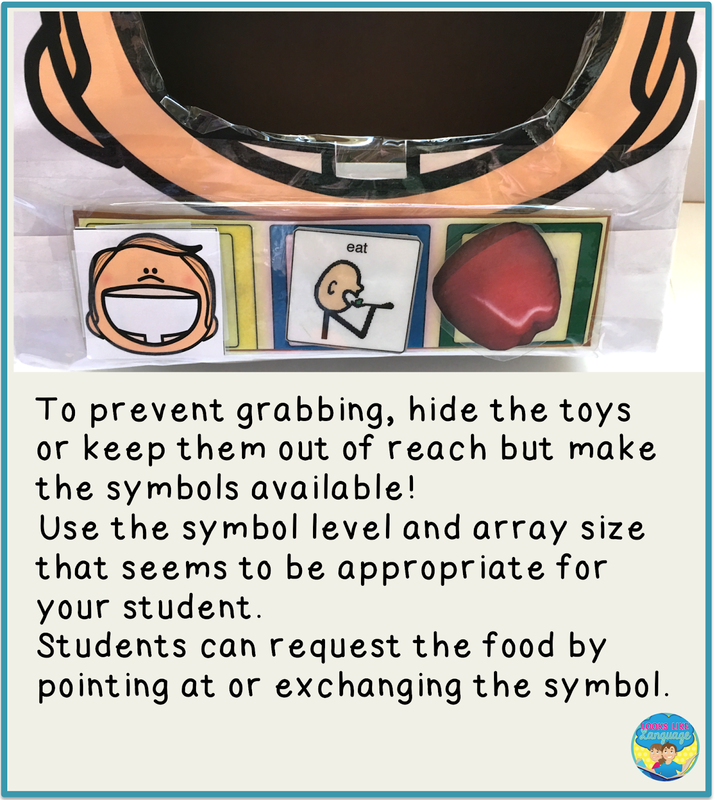 Tip 5: USE BOOKS TO BUILD SYMBOLIC PLAY! This book has repetitive text for what the pets eat. Use craft glue to put small pieces of the foods in the bottom of empty, clean plastic fruit cups. It dried clear, keeping the pieces from falling out and kids from trying to eat them. After each page, the students could put the toy animal in the matching food cup to ‘feed’ them. Tip 6: MIX & MATCH! Having many items in the same theme to mix and match is so useful! 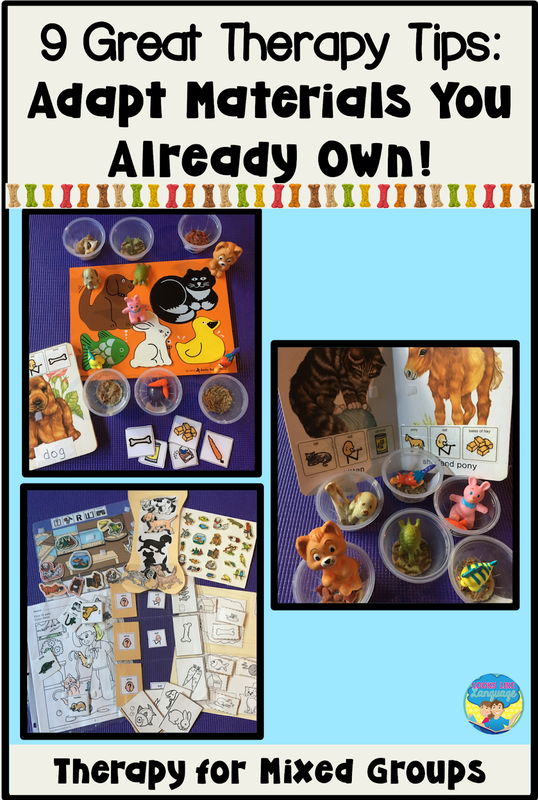 • There’s lots of opportunities to label and use or expand language skills. • Combining items in different ways aids generalization. 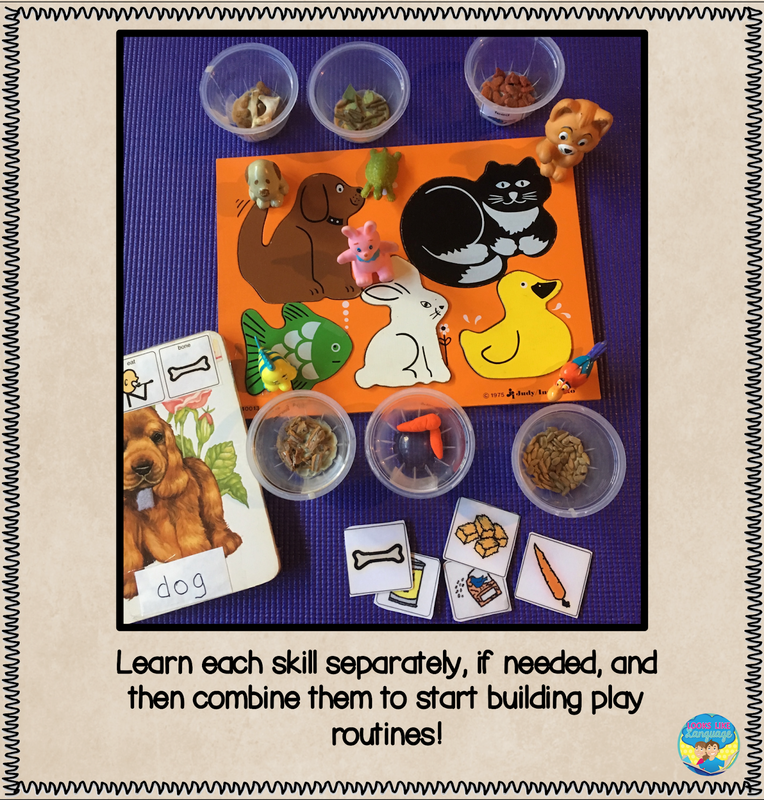 • Building skills with different play combinations helps students to develop symbolic play. 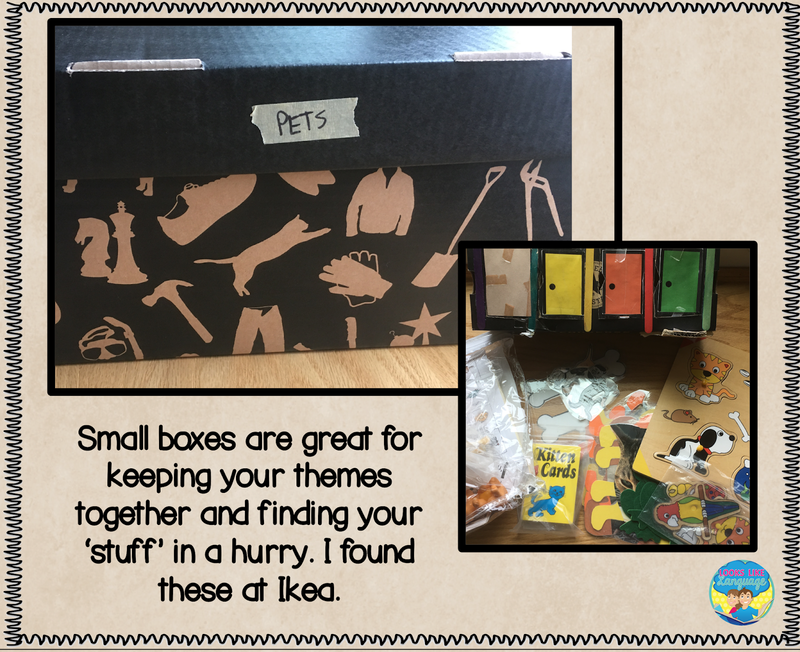 Admittedly, it can be a pain to cut through shoeboxes, but they offer such inexpensive ways to incorporate hands on fun and lots of language! 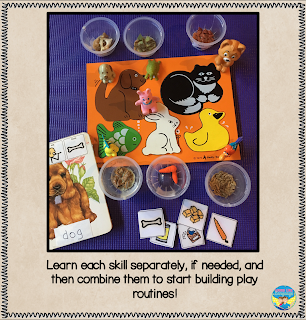 After warming up by labeling the pets with the puzzle, you can have some pretend play! "The animals are inside, but they are hungry. Let’s take them out." "Who wants to eat first?" "I think I hear “meow.” What is it? Let's open a door!" You can emphasize concepts, sentence structure, question words, auditory skills, you name it! Students who are minimally verbal can respond using the pet symbols you made by taking photos of the puzzle pieces, or the puzzle pieces themselves. Tip 8: TURN WORKSHEETS INTO PLAY! 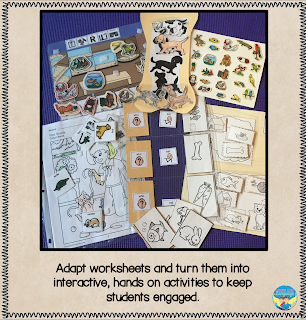 Worksheets with pictures are great to turn into hands on activities. 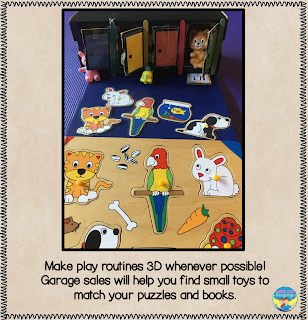 • Sticker activities that are laminated and turned into a pet shop game. One set is an enlarged version so that the students had to specify the big/little pet. • Shape matching pages turned into a game. 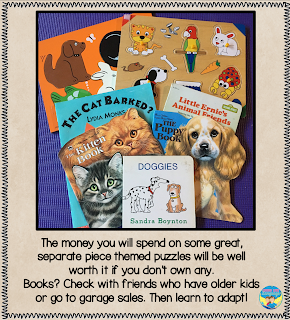 • Hidden picture pages put into a page protector to make a matching activity using pet symbols. The pictures of the hidden animal were colored in this set for a student who was just beginning to visually discriminate. 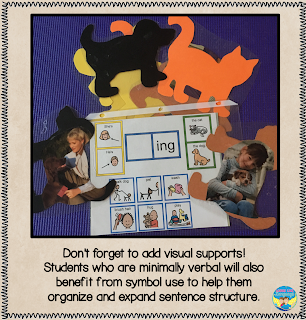 • A trading card plastic page that was adapted with symbols for students to match the associated pet and say the sentence. Tip 9: USE ANY SUPPLIES YOUR SCHOOL OFFERS! My school had Ellison cutters and construction paper available. Adding pet photos on the back before laminating made a simple game. Students requested the color cat or dog and then turned it over. The visual support helped the minimally verbal students form a sentence while the more verbal students used correct grammar in their productions. As always, TpT can save you so much time with high quality materials! 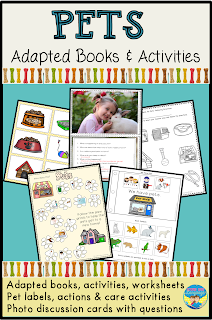 Check out my Adapted Books: PETS Themed Activities and add your own toys for some interactive fun! 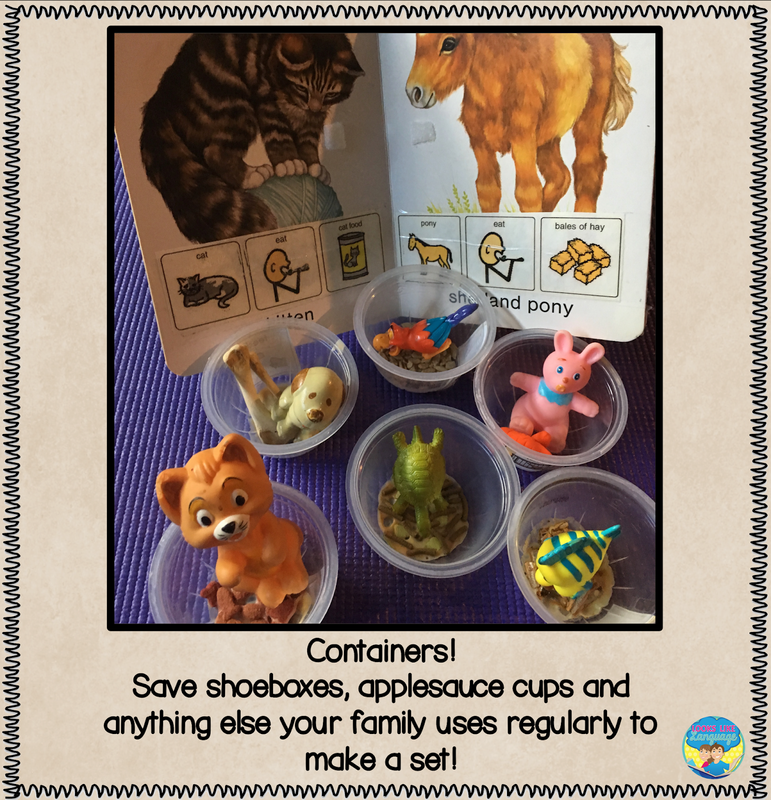 More Shoebox Play Tips: Teaching Core Vocabulary EAT! Your student picks up the toy and sets it back down again. Maybe he lines them up or maybe she tries to roll them before ignoring them entirely. Since we know that developing children's play skills is vital for expanding cognitive skills needed for communication growth, what is an SLP to do? With neurotypical children, the goal of therapy is to develop as many of the missing skills as possible and expand them upward towards a higher chronological age level. Working with kids on the autism spectrum, it may be more useful to think of therapy goals as advancing one functional skill as broadly as possible. Developing a deep understanding of a skill or idea and as broad of functional, expressive use of the skill in many different contexts helps the child with autism to be better able to generalize skills. The photos in this post show one way to start with a basic set of vocabulary words, determine a symbol level to use, and bring the vocabulary into basic sentence structure. 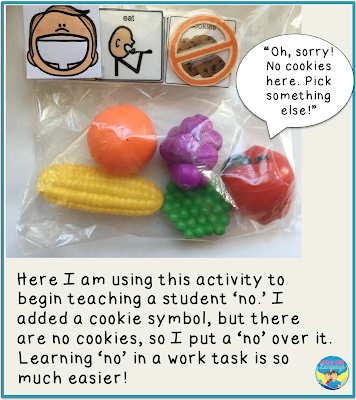 Add some pragmatics, like requesting, commenting and 'no,' to build in functional communicative uses. Bring in some literacy and play skills using the same words. You have given your student the visual equivalent of word association skills, building word knowledge and use, adding a slightly expanded skill to the base you started with. This way, while you are building your student's communicative skills, you are also maintaining what was learned and expanding skills in a way that only adds one new piece at a time. Working in little chunks makes learning less intimidating and frustrating; more achievable and successful. Would you want to go straight to the final in your most demanding class or learn each step a little at a time? Start with a set of toys and a nice sturdy box to visually show how to play. Shoeboxes are great, but any sturdy box can do! 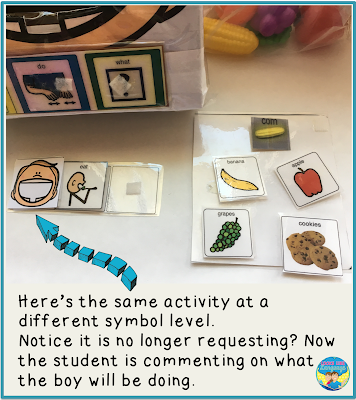 You also have to determine the symbol level the student understands so that you can add communication skills to the play task. This photo shows a way to use a ravioli plastic and play food in a simple matching activity. The symbols are at varied levels, from cut out photos or TOBIs (True Object Based Icons that show the object’s shape,) to photos, and then symbols. 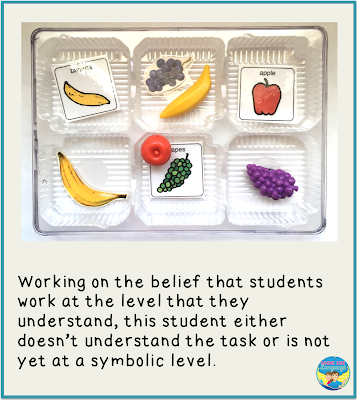 When asked to ‘match’ the fruits, the student is likely to choose the most meaningful symbol for matching. 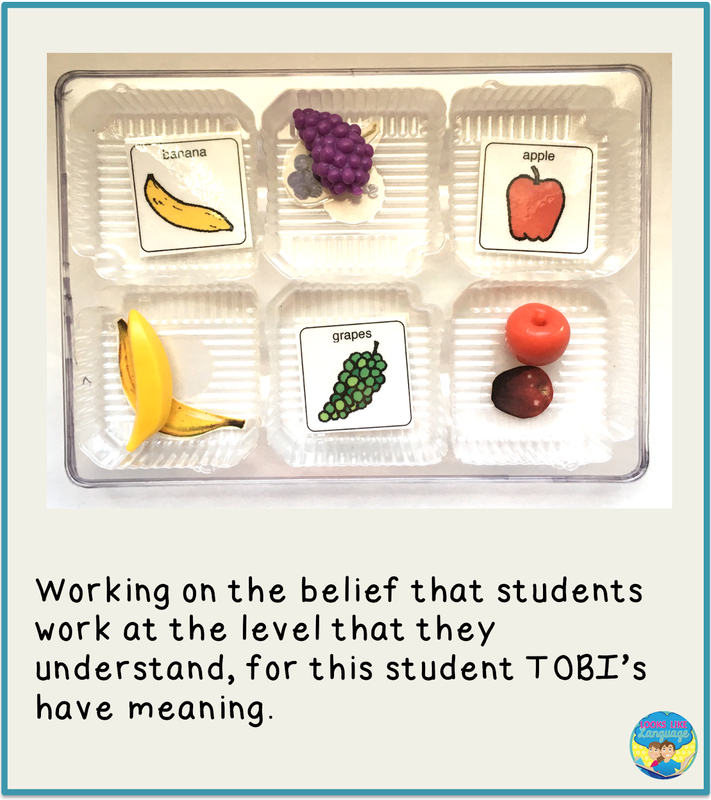 In this example, the student matched the play fruit to the TOBIs, so that is the type of communication symbol I would use in the activity. Another matching activity to try out is to have the student match the toy fruits to the real versions. 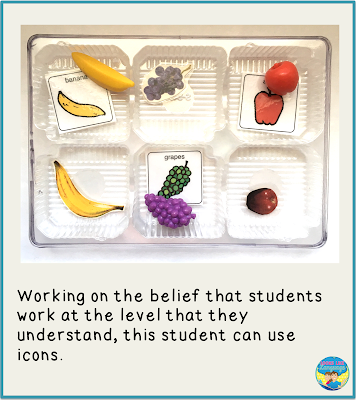 Toys are easier to use in play activities, but students need to understand that the plastic banana represents a real banana for the concept of ‘eat’ to be developed. 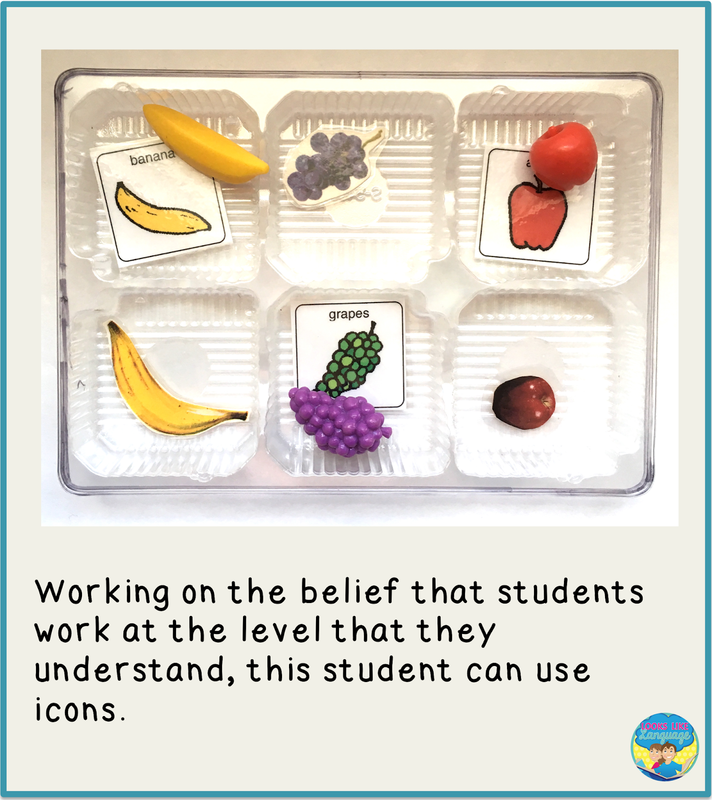 Notice that this student correctly matched the fruits to the icons, including matching the purple grape toy to the green grape icon rather than the purple grape photo. This shows a higher level of symbolism than in the last example. If this student understood the direction, “Match.” and this result is typical, it seems that the student is not yet at a symbolic level. 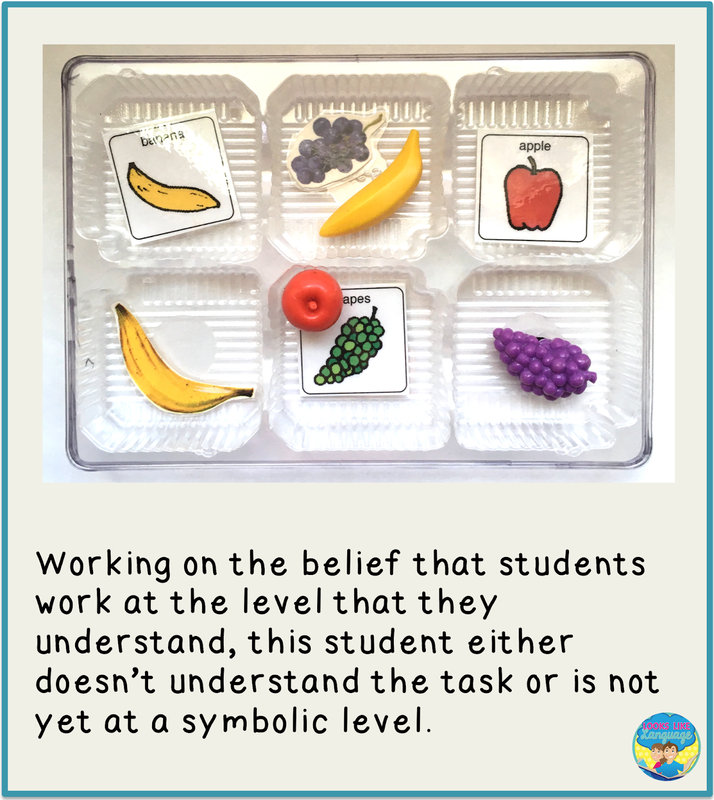 Assessing if the student uses actual objects correctly and working on developing a symbolic communication system for basic desires may be the way to go at this point in time. 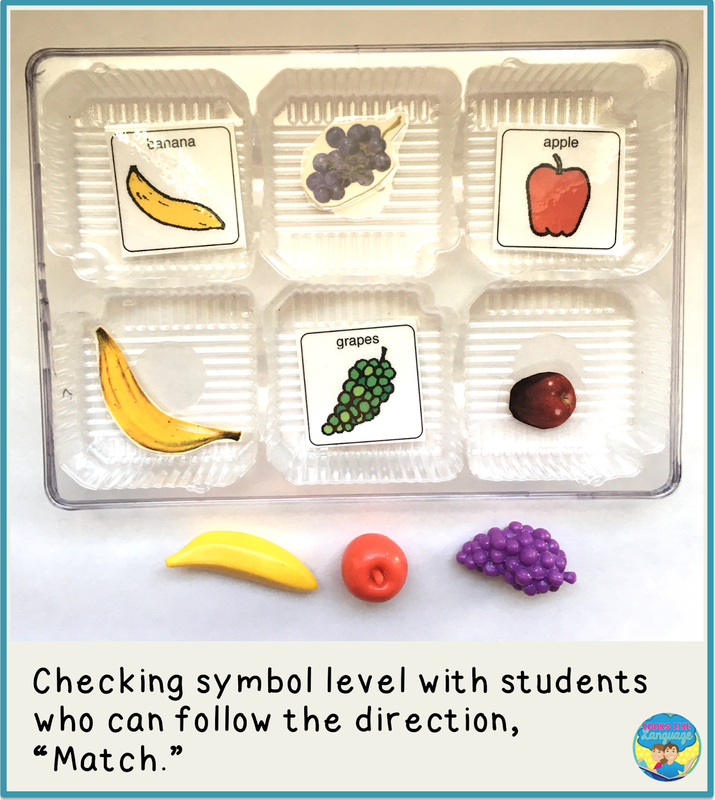 Students who don’t comprehend any pictorial symbol system may benefit from using an object system, such as using a spoon to request cereal. Here you can see the box that has been decorated with a hungry child who has a huge mouth cut open to place foods inside to feed him. 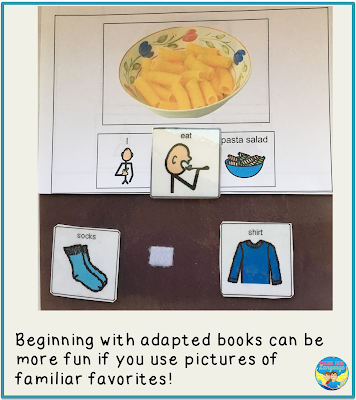 Pointing at the symbols as you say them, whether they are paper symbols or symbols on an AAC device, is a vital teaching method for students using AAC. 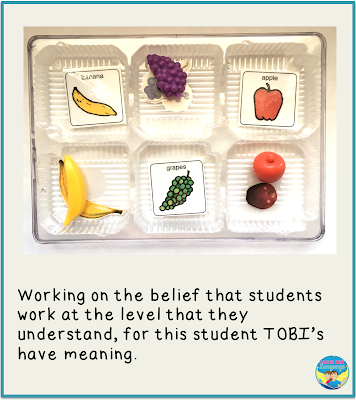 Seeing the symbols as the word is said can help the student assign meaning to the verbal words, as well as modeling how to express the ideas. To build expressive communication skills, have the student point at each symbol in order as you say the sentence. This is a strategy to help build joint attention. 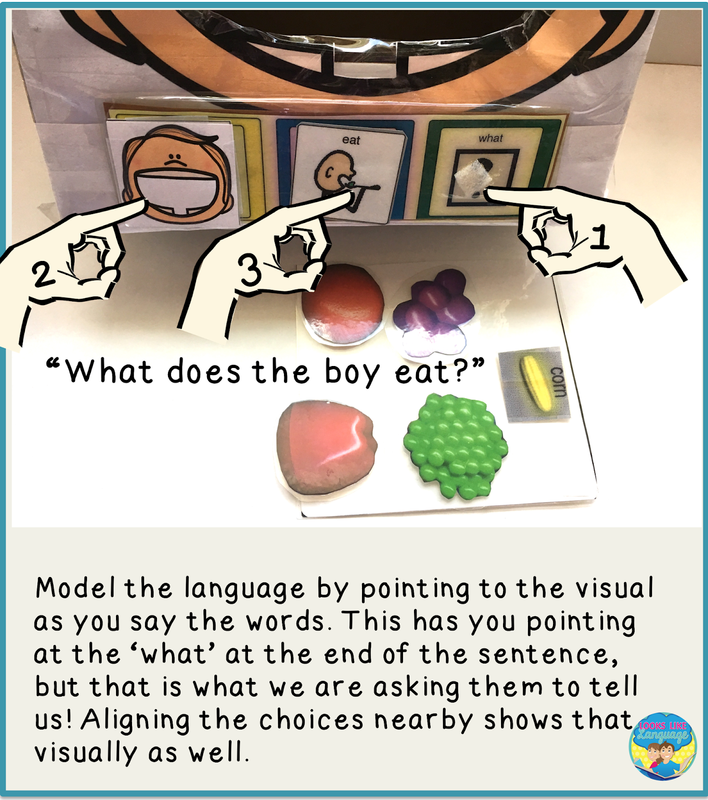 The student should be looking where he is pointing, and hearing the word said verbally as he points to the symbol can help him learn to connect the oral word with the symbol. 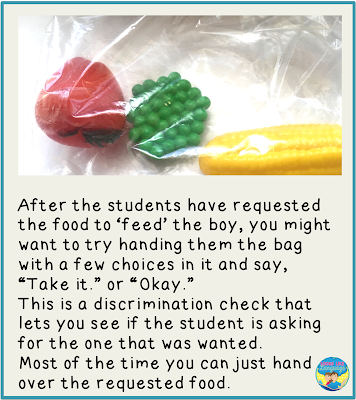 To check comprehension and symbol discrimination, occasionally make sure to tell the student, “Take it.” and offer them an array of food toys after reading the sentence aloud. If they correctly discriminate the symbols, they will take the food toy that they chose to finish the sentence. As students become more familiar with the activity and more adept at formulating sentences, students can have access to all of the foods to feed the shoebox kid one food at a time. 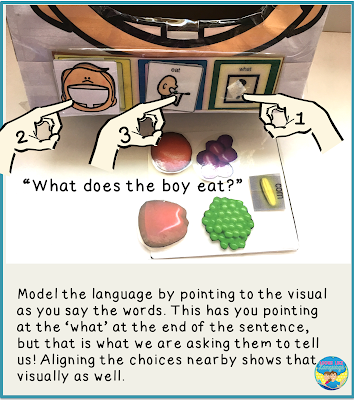 Either immediately before or after feeding the shoebox kid, the student can formulate a sentence to tell what the kid ate. Notice that this fulfills a different communicative function! 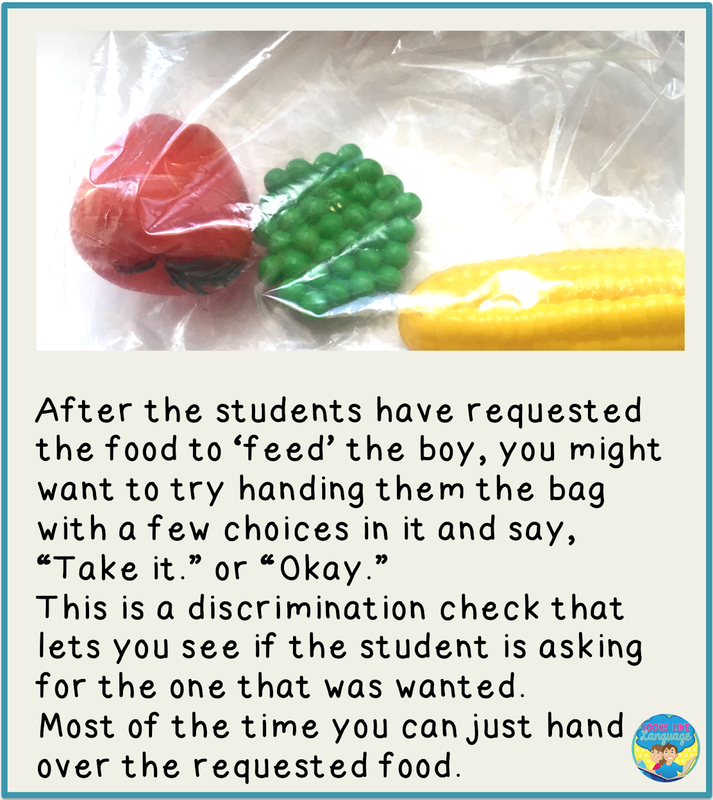 Instead of filling in the last food as a way of requesting what to feed the toy, the student is now formulating a complete phrase to comment on what was/will be eaten. 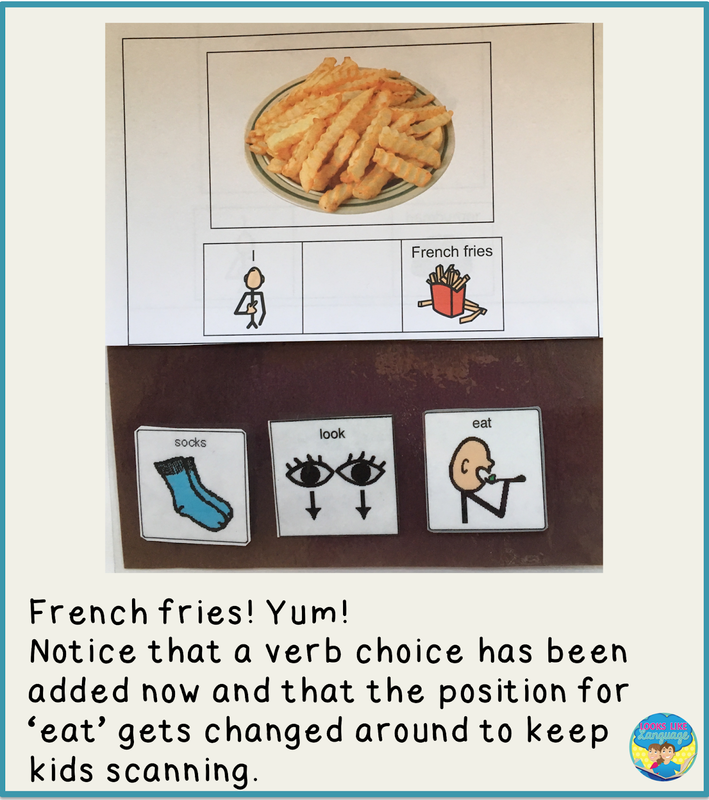 When your students understand and produce basic sentences around the core word ‘eat’, don’t be too quick to move on only to a new core word. Think about how else this skill can be used in a different context to deepen word knowledge. 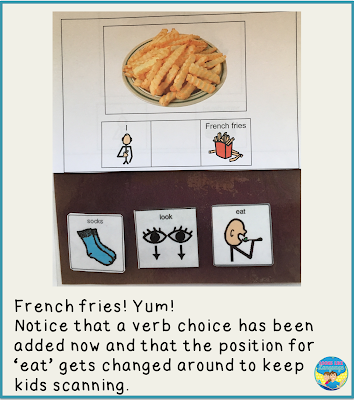 In this photo, you see an activity that works on the core word ‘eat’ in a different communicative context- learning that sometimes we don’t or can’t eat even if we want to. This reinforces and gives continued practice to the core word ‘eat’ even if other activities in the session are introducing a new core word. 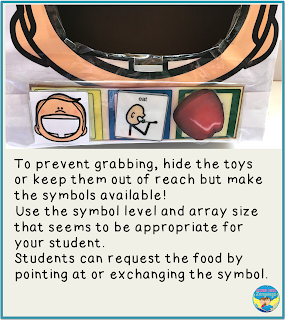 As students become more skilled at using 3D objects in play, start fading the shoebox if the student has the motor skills to manipulate toys without the stability the box provides. 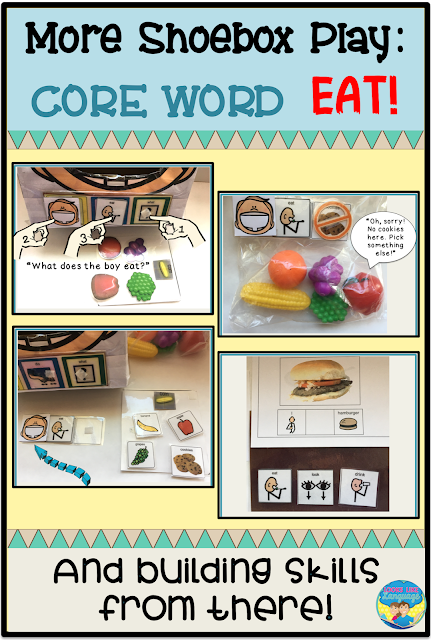 As you move on to teaching new core words, it is important to continue to review and expand the previously learned skill sets. Maybe the student enjoys this familiar play activity now and might request it for a work break. Maybe it is time to expand the activity to a higher symbolic level with a 2D version of the concepts. When a student is able to enjoy and participate in paper play activities, adapted books are great materials to use in therapy! 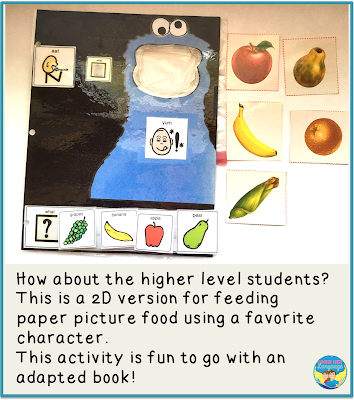 Reading a book and then playing an associated activity is a great technique for reinforcing the language and plot of the story. 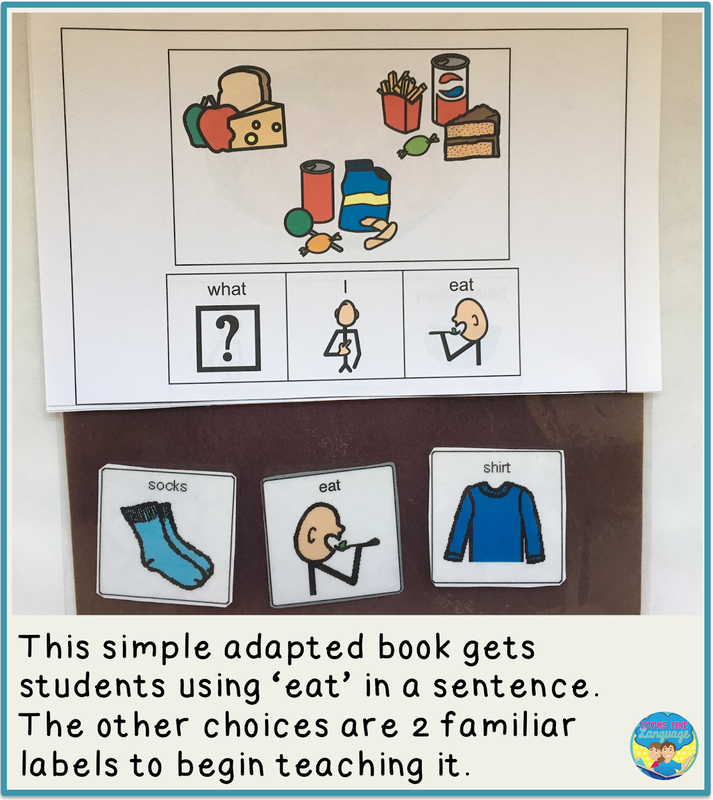 This photo shows the cover of a simple adapted book that starts students using the core word 'eat' in sentences to communicate about varied foods. Notice that initially, the symbol for 'eat' is in a field of 3 with familiar non-food symbols to help the student discriminate easily. Errorless learning is a good way to go! 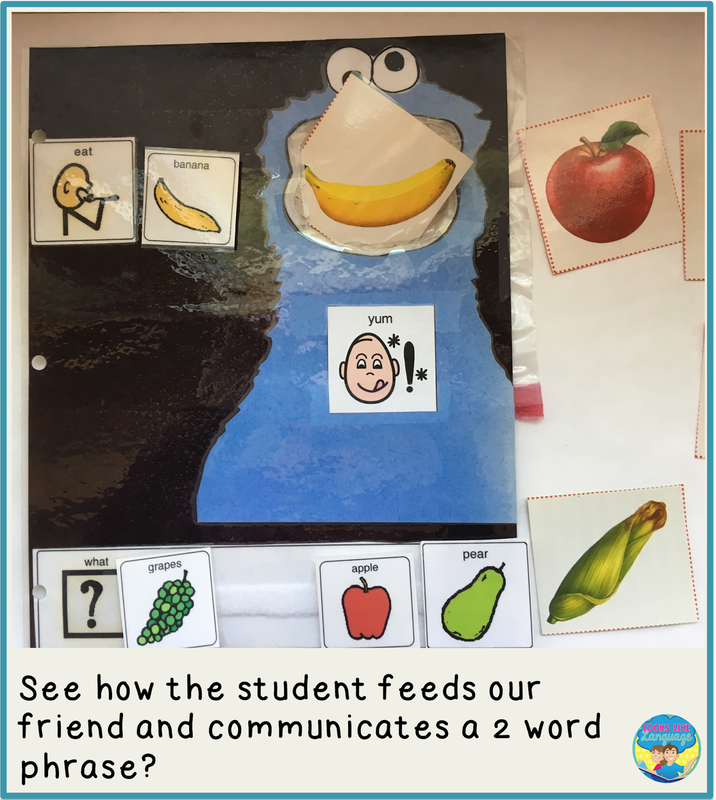 Helping your students make sentences to share information about their favorites is a great way to keep their attention and build functional skills! When students master a step, build the difficulty incrementally, depending on the student's learning rate. This photo shows an additional verb symbol being added in place of one of the object symbols. 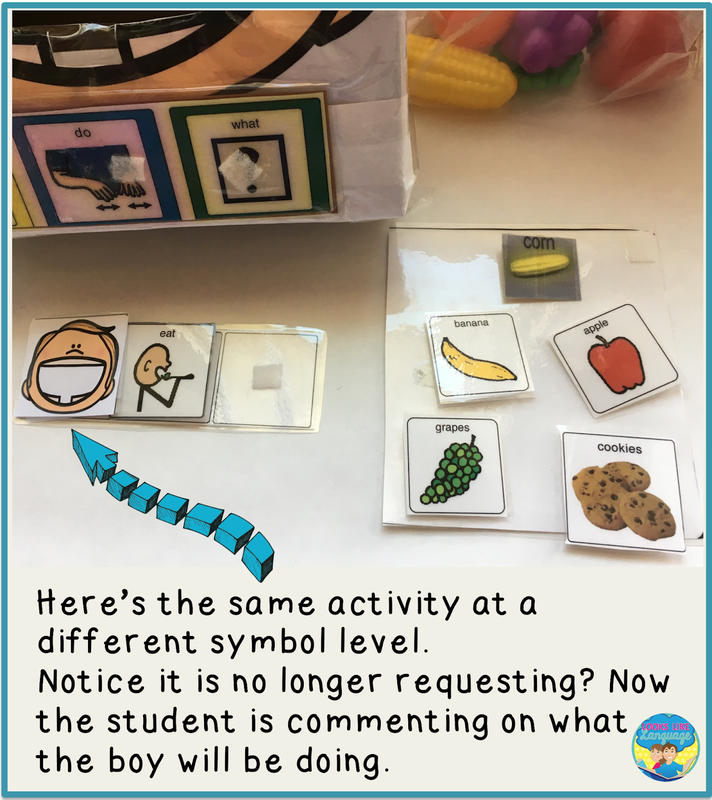 Moving the symbols around helps the student keep scanning, but new studies show that competent communicators using an AAC device express themselves more fluidly by using the location of the symbol on the device rather than always scanning the page. Now the adapted book has 'eat' as a choice along with 2 other verbs. One looks similar to 'eat' and the other is different in appearance, making discrimination easier than using 3 very similar action symbols. Many students do not need this level of discrete steps to make progress, but if you have a student who is becoming frustrated you may need to build skills in incremental steps such as these. I was so excited to be featured on The Speechie Show! 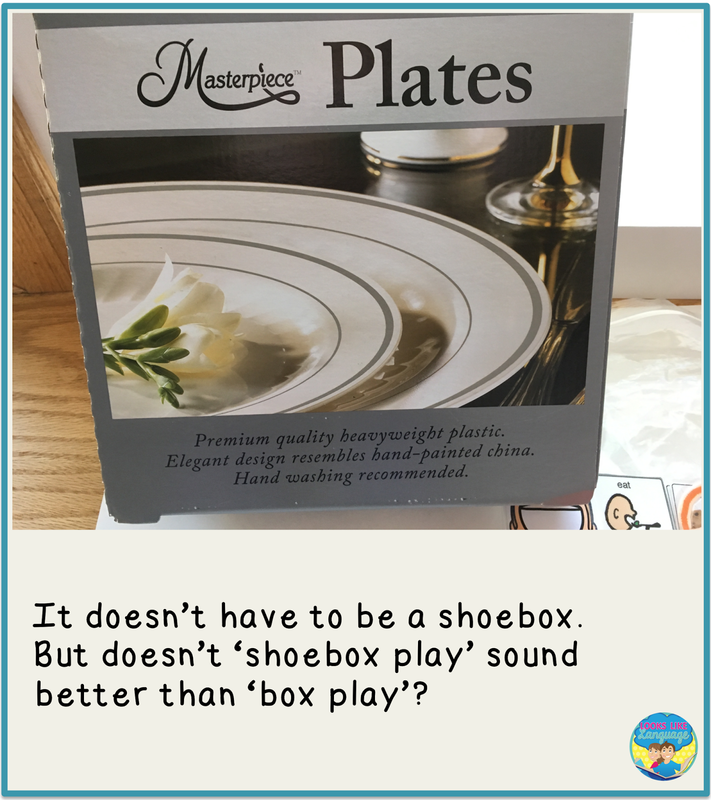 I wrote this post to give you some more ideas about the shoebox play I discussed on the show. If you missed it, you can see me live here! If you are looking for more shoebox play ideas, click here for car play and here for playground ideas. Many thanks to Barbara Bloomfield for getting me started. Rest in Peace.